It’s been a while, once again. Sometimes I think I get too hung up on making each post some sort of magnum opus. Let me resolve to post more often (cause that’s a good thing, right?) and not worry about breaking new ground each time I do so. Yesterday I attended a product showcase courtesy of Preiss Imports and the Northern California chapter of the USBG held at the Anchor Steam Brewery in San Francisco. Believe it or not this was my first ever time inside the place. I had the chance to sample many great spirits as well as getting me some more education on single malt whiskies, this time as done by BenRiach, Glendronach, and Springbank (to name just a few of the luminous brands available for sampling). I will confess, however, that my heart made the most flip-flops when I trundled downstairs and visited the distillery portion of the premises. 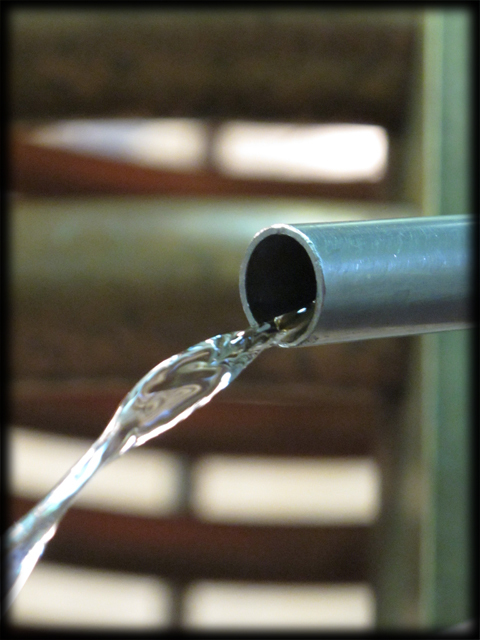 Yes, here was the humble copper wellspring from which the lovely lovely Old Potrero rye doth flow. 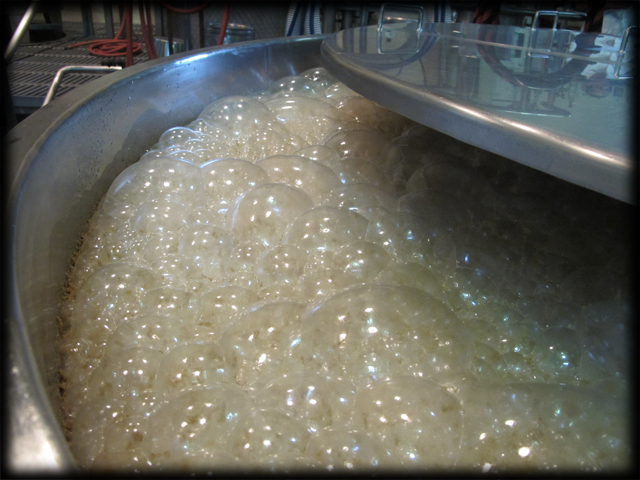 I got to see a bubbling pot of mash as well as a chance to sample the low wine (first distillation) straight off the worm. This entry was posted on March 15, 2011 at 5:13 pm and is filed under Bourbon and Rye, Musings. You can follow any responses to this entry through the RSS 2.0 feed. You can leave a response, or trackback from your own site. Sometimes I wish I didn’t have a job… Or at least, I wish I had one that didn’t require me to be in the office from 9-5 every week day. The upside of chronic underemployment. Tasted Old Potrero Single Malt a couple of months ago and thought it was amazing. They’re not open to the public for tours, right? Highly recommend St. George Spirit’s tasting & tours, if you haven’t been. Charbay is interesting too, but you can’t taste most of their spirits at the tour, just the wine and liqueurs. I don’t think the distillery is normally toured as part of a brewery visit but I could be wrong. I’ve been to St. George/Hangar 1 several times. Lots of good things to sample there as well. I’ve got a real soft spot for the Old Potrero rye however. I love it’s malty goodness. Nothing else quite like it on the market. 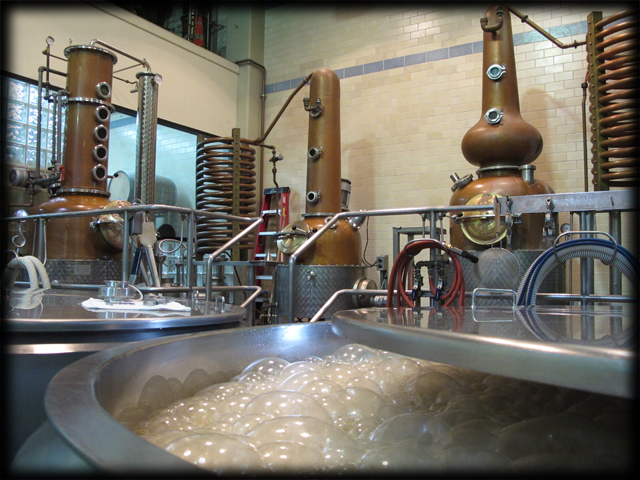 Last I heard, the anchor distillery tours and/or tastings of the distilled spirits were only allowed for private events, due to the way the licensing works with the ABC. I think their bar only has a beer-wine license. I know the rules regarding spirits tastings have recently been slightly loosened, but I am not sure if Anchor has done anything to change their license. Erik — do you have any details on how the rules about spirits tastings have changed? I know St. George actually pays a distributor to take their stuff away, let’s it get taxed, and then buys it back so that they can serve it on-site. Ridiculous. Michael — just recently tried Old Potrero Single Malt at a friend’s place. Was really, really impressed. But where can I buy the stuff?? You can find it, when it’s available, in better liquor stores throughout the city. Keep your eye on the shelves @ K&L, Blackwell’s, J. Walker, and Cask (for starters). There’s also an ultra rare (and generally very expensive) third product called Hoatling’s which is aged 15 years in used barrels. Possibly it was only made once. There’s a bottle of it @ Elixir if you want to buy a pour and sample it. The change in the law allows properly licensed liquor outlets to serve 1/2 oz tastes of spirits. K&L and others are already doing this. It does not allow for mixed drinks or anything like a bar. I am not sure if the goods must be purchased through the distributor. Erik — I think I remember reading something like that. I seem to remember that it’s 1/2 oz. per customer per visit right? I couldn’t pour 1/2 oz. tastes of 3-4 spirits? Michael — Thanks for the tips. The one I tried was the higher proof one. Seems like there’s a lot of nice wine & spirits stores in the city. I’ve been thinking about opening a nice spirits store in the East Bay (I live in Berkeley). Do you know any good ones besides Ledger’s? In the East Bay, there’s nothing better than a visit to Ledger’s. However it’s also worth checking into Piedmont Grocery which has a decent (thought much smaller) selection. You think the East Bay could benefit from another really good spirits store specializing on artisanal and harder-to-find spirits?